Spinal tumors are classified by their relationship to the spinal cord and its coverings. The spine is composed of individual bones (vertebrae) stacked one on top of the other in a column. Each vertebra possesses a cylindrical body, which participates in weight bearing and an arch of bone (laminae and spinous processes) which protects the spinal cord and its coverings. The bony arch is connected to the body by two small columns of bone (pedicles). The circular canal between the body, arch, and pedicles houses the spinal cord and is called the spinal canal. The spinal cord is contained within the spinal canal and is covered by a layer of connective tissue, the dura mater. Tumors which are located outside the dura are called extradural. These are usually metastatic tumors and most often arise in the vertebrae themselves. Tumors arising inside the dura, but outside the actual substance of the spinal cord are termed intradural-extramedullary. These are usually nerve sheath tumors or meningiomas. Tumors arising within the substance of the spinal cord itself are called intramedullary tumors. These are usually astrocytomas or ependymomas. Different types of tumors often behave differently and require different treatments. These tumors involve the bony vertebral column and are usually metastatic. That is the original, or primary, tumor arose in another organ. The most common metastatic spinal tumors in women are from the breast and lung. In men, they are most often from the prostate and lung. Tumors arising from bone and cartilage cells do occur in the spine, although with less frequency. Osteogenic sarcoma is a malignant bone tumor. Osteoid osteomas are benign. Meningiomas and nerve sheath tumors (schwannomas and neurofibromas) comprise the overwhelming majority this subset of spinal tumors. Meningiomas arise from the arachnoid mater (a thin covering layer of the spinal cord which is located inside the dura), and are most common in middle aged and elderly women. Schwannomas and neurofibromas arise from the nerve roots which come off the spinal cord. Meningiomas and nerve sheath tumors are usually benign. Filum terminale ependymomas arise at the base of the spinal cord and may be large and adherent to many nerves, making total removal sometimes difficult. These tumors usually arise from supporting cells (glia) within the substance of the spinal cord itself. Astrocytomas and ependymomas account for the majority and occur with about equal frequency. Hemangioblastomas are less common and sometimes occur in conjunction with Von Hippel Lindau disease (a disease in which patients are prone to developing cysts in the kidney and other organs). Intramedullary tumors occur most often in the cervical spinal cord and are often benign. Spinal tumors may cause a variety of symptoms depending on their type, location, and rate of growth. In general pain in the neck or back followed by neurological problems, such as weakness or numbness of the arms or legs or a change in the normal bowel or bladder habits, is most common. In patients already diagnosed with cancer of another area of the body, the new onset of spinal pain may indicate a spinal fracture caused by weakening of the vertebrae by metastatic tumor. Tumors which arise inside the dura are rarely metastatic and are usually slow growing. Patients with these types of tumors may have pain for years before any neurological problems occur. Patients who have symptoms which are suspicious for a spinal tumor should be comprehensively evaluated by a neurologist and/or neurosurgeon. Evaluation includes a complete medical history, physical and neurological examination, and some kind of radiographic study of the spine. The most frequently used and most accurate study is a spinal MRI scan with and without intravenous gadolinium (a contrast-enhancing agent that makes some tumors light up brightly). 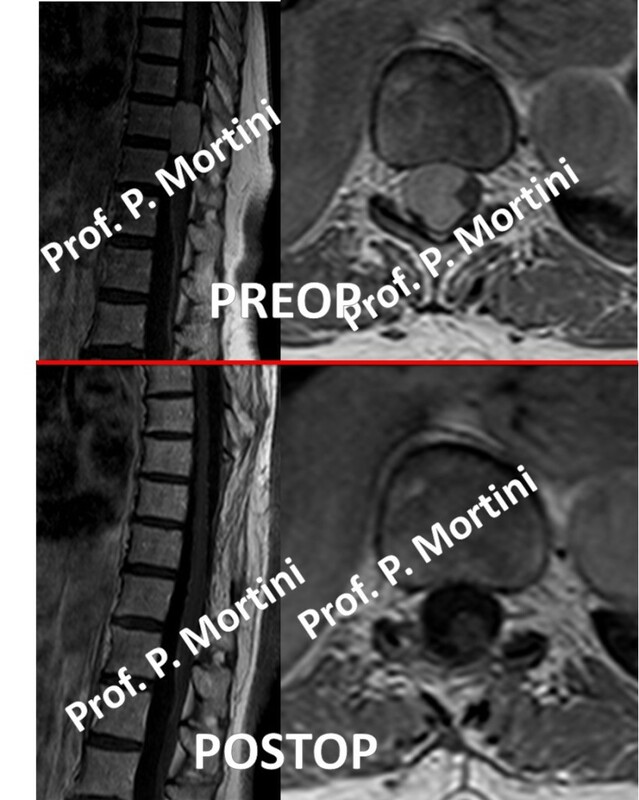 These scans adequately image the spinal cord and its associated nerves. Detail of the bony vertebral column is not as good as CT (computed tomography – a CAT scan), but is usually adequate. Other radiographic studies such as CT – myelography (CAT scanning after a radiographic contrast substance is injected into the spinal fluid) or spine x-rays may also be necessary depending on the type and location of spinal tumor and its effects on the spine. The treatment for most intramedullary and intradural-extramedullary spinal tumors is surgical excision. The goal is total removal of the tumor with maximal preservation of neurological function. Most intradural-extramedullary tumors are amenable to total resection with minimal or no neurological problems postoperatively. Large filum terminale ependymomas may often be impossible to totally remove since they adhere to many spinal nerves. Post-operative radiation therapy may improve outcome in these cases. Intramedullary ependymomas and hemangioblastomas are usually well differentiated from the surrounding spinal cord and can often be removed completely. Patients often have temporary neurological problems postoperatively, however these often resolve. Intramedullary astrocytomas blend in with the surrounding spinal cord and are thus difficult to remove completely. Since these tumors are usually slow growing, patients may still experience a significant benefit from subtotal removal. Tumors which have aggressive microscopic (histopathological) characteristics and are not totally removed are usually treated with postoperative radiation therapy. For most operations on or near the spinal cord careful neurophysiological monitoring (SSEP’s and MEP’s) is necessary. Since these tumors are often metastatic curative therapy is usually impossible. Treatment most often consists of reducing spinal pain caused by the tumor, removing any pressure on the spinal cord, and maintaining the mechanical stability of the spine. For tumors which do not compress the spinal cord or destabilize the spine, radiation therapy often significantly reduces spinal pain. Surgical treatment may be beneficial for patients who have symptoms due to compression of the spinal cord or mechanical instability of the spine. Operative therapy may consist of removal of the portion of the vertebra involved with tumor to decompress the spinal cord and placement of acrylic or banked bone and metallic implants to preserve the stability of the spine. Benign tumors of the spinal column can often be totally removed. Fusion of the spine with bone grafts and metallic implants may be necessary to preserve spinal stability in these cases also.